Should the Warriors Try to Acquire Carlos Delfino? When NBA Free Agency opens on July 1st, the Golden State Warriors should try to increase the depth of their roster. 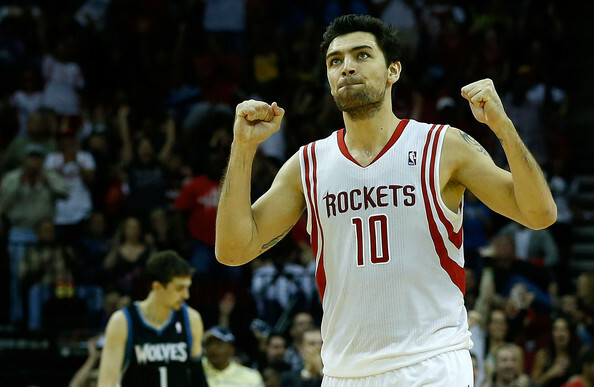 According to Tim Kawakami of the San Jose Mercury News, the Houston Rockets plan on declining Carlos Delfino’s $3 million team option for the 2013-2014 season, which means Delfino will be a free agent. It’s not clear yet which teams will have the most interest in him, but should the Warriors try to acquire him? Delfino will most likely be a cheap option as a free agent, but, with that said, the Warriors don’t exactly have a ton of money to spend. Carl Landry has opted out of his player option with the Warriors for next season, so he’ll probably receive a multi-year deal from another team. If the Warriors make a hard push to re-sign Jarrett Jack, it doesn’t seem like they will have any money left to acquire a player like Delfino, even if he doesn’t cost much. Hypothetically, let’s assume the Warriors have the cap space to sign him. Would Delfino be a good fit for the Warriors? Last season with the Rockets, Delfino averaged 10.6 points, 3.3 rebounds, 2.0 assists, and one steal on 40.5 percent shooting from the field, 37.5 percent shooting from three, and 85.7 percent shooting from the free-throw line in 25.2 minutes per game. Delfino is listed at 6’6″ and 230 pounds. Given his size and frame, he is able to play shooting guard, small forward, and even power forward sometimes in small ball lineups. His versatility would be a significant asset off the bench for the Warriors. Delfino is a good three-point shooter, so he would allow the Warriors to spread the floor even more and take advantage of their already stellar three-point shooting. He also plays pretty decent defense and can come up with a steal every once in a while, so, given his wide range of skills, he could be a nice addition to the Warriors’ bench. Given how many young players the Warriors have, he also would provide a quality veteran presence off the bench as well. Delfino has played seven years in the NBA so far, and he has played for the Detroit Pistons, Toronto Raptors, Milwaukee Bucks, and Houston Rockets. He also has played in 41 playoff games in his career, which would certainly be a valuable asset to a team who has limited playoff experience. The Warriors already have several small forwards, such as Harrison Barnes, Brandon Rush, Draymond Green, and Richard Jefferson. However, if the Warriors are able to get rid of Jefferson’s expiring contract in a trade, Delfino could be a great addition to this team. Also, if the Warriors aren’t able to re-sign Jack, the Warriors will need to add more depth to their roster in order to make up for some key reserves. Given the structural and financial limitations that the Warriors have, it doesn’t seem likely that they’d acquire Delfino, but if given the option and the right situation, he might be a solid veteran, versatile player to add to this young roster. For much of the season, Barnes became the X-factor for the Warriors, meaning that if he played well, the Warriors would win most of the time. He also showed that he can come up big in the biggest moments. In the postseason, Barnes elevated his game to a whole new level. 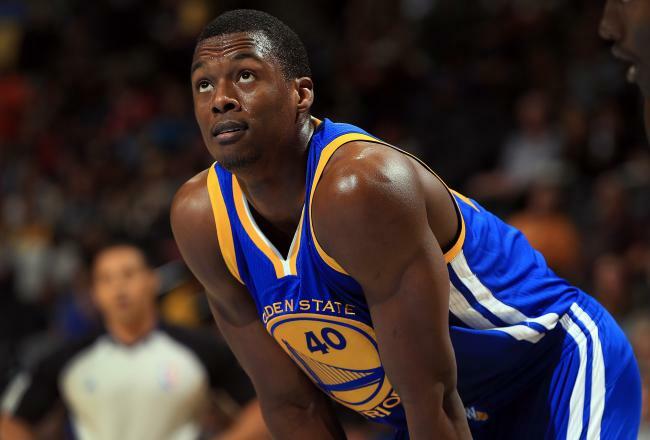 After averaging 9.2 points and 4.1 rebounds per game in the regular season, Barnes averaged 16.1 points and 6.4 rebounds per game in 12 postseason games. He also shot a higher percentage from the field, from three-point range, and at the free-throw line. Barnes has so much potential, and he’s so fun to watch, mostly because of all of his vicious dunks. He has shown flashes of brilliance that leads many Warriors fans to believe that he could one day become one of the best small forwards in the NBA. He also has this veteran-like demeanor that makes fans believe that he’s going to continue to work as hard as he can to get better and help the team. If Barnes continues to stay aggressive on offense, shoot efficiently, and learn to defend more consistently, he will have a huge breakout season for the Warriors next season. Bazemore might not have a “breakout” season in the same way that Barnes might, but he certainly has the potential to become a key contributor to the Warriors next season. 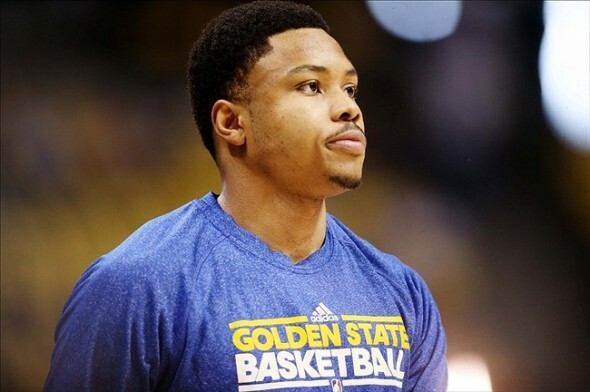 Bazemore will have a huge opportunity in the upcoming Las Vegas NBA Summer League to prove to the Warriors that he can become a valuable part of the regular rotation. Bazemore is known for his defensive ability. He can block shots, get steals, and guard point guards, shooting guards, and small forwards. He needs to prove that he can become more of a scorer though. If the Warriors aren’t able to re-sign Jarrett Jack, Bazemore will have an even bigger opportunity. Along with Scott Machado, he will compete for backup point guard minutes. It’s likely that he could take over the majority of the minutes that Jack used to play though because of his ability to play both the point guard and shooting guard positions. Bazemore needs to work on his shooting, but he doesn’t need to average 15 points per game, especially with Brandon Rush coming back next season. If he can contribute about eight points per game, he will, in his own terms, have a breakout season for the Warriors and become a key contributor off the bench. 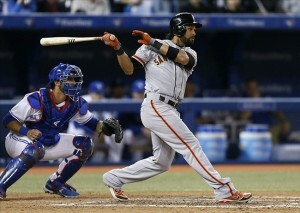 San Francisco Giants: How Much Will They Miss Angel Pagan? 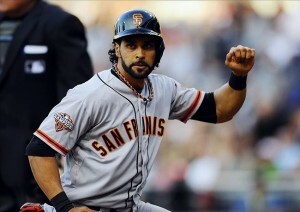 Angel Pagan is a sparkplug. He provides so much energy for the San Francisco Giants as their center fielder and leadoff hitter, and he was a significant contributor to their World Series win last season. However, Pagan’s current situation could significantly impact the Giants for the rest of the season. Pagan initially strained his left hamstring on May 25th when he scored an incredible inside-the-park home run to walk-off against the Colorado Rockies. Pagan recently aggravated his strained left hamstring while on a rehab assignment with the San Jose Giants. An MRI done on Saturday revealed that Pagan actually has a small tear in his left hamstring. 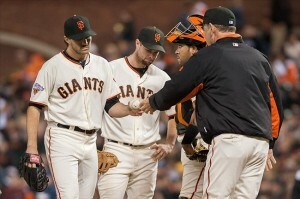 Because of this, Pagan has elected to have surgery to repair the torn hamstring, and he will be sidelined for 12 weeks. This could significantly impact the Giants’ chances of winning the NL West. The Giants have already experienced a multitude of injuries to other key players on their roster, such as Marco Scutaro, Ryan Vogelsong, Santiago Casilla, and Pablo Sandoval. Scutaro is playing through his injury and both Casilla and Sandoval are expected back soon, but given Pagan’s energy and enthusiasm, the Giants will surely miss his presence on and off the field. In 46 games this season, Pagan is batting .262 with three home runs and 24 RBI. He also has walked 15 times. Pagan truly is their sparkplug on offense. He’s an effective leadoff hitter given his ability to steal bases, run the bases aggressively and efficiently, and get on base by getting a hit or taking a walk. Pagan is also able to stretch out a hit and gain an extra base because of his speed, since he can score from second on a single and score from first on a double. In addition, Pagan scored 95 runs last year for the Giants and he led MLB with 15 triples, so he is clearly the best option as the leadoff hitter for the Giants. However, in his absence, Gregor Blanco has really stepped up and shown that he can more than adequately fill in for Pagan in the leadoff spot. First of all, Blanco is versatile. He can play all three outfield spots extremely well. Second, Blanco has been on a tear recently on offense. In the month of June, Blanco is hitting .373 with one home run and 10 RBI’s in 75 at-bats. He also has a .413 OBP and a .533 slugging percentage. Overall, Blanco is hitting .302 with one home run, 26 RBI, and has a .354 OBP and a .401 slugging percentage. Andres Torres has been a little streaky on offense, but for the season, he’s hitting .269 with two home runs and 16 RBI’s. Also, Juan Perez got off to an amazing start with the Giants, but he’s cooled off a little since his major league debut. He’s still hitting a respectable .300 though in 30 at-bats though. The Giants will definitely miss Pagan on offense and his effectiveness in the leadoff spot, but given Blanco’s recent production, the Giants must feel a little more comfortable. 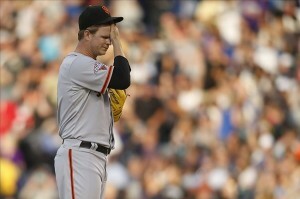 However, twelve weeks without Pagan is a long time, so everyone on the Giants will have to step up, not just Blanco. Since Pagan will be gone until September, Blanco, as well as Torres and Perez, will have to maintain consistency throughout the rest of the season. Pagan’s absence won’t be missed as much on the defensive end. Defensively, he is arguably the fourth-best center fielder on the Giants behind Blanco, Perez, and Torres. These three players have been able to display their defensive prowess while Pagan has been out, so the Giants shouldn’t be concerned missing Pagan’s defense. Pagan is a leader in the clubhouse because of his passion and enthusiasm for the game. He’s an extremely hard worker who sets a good example for the younger players on how to work hard and play the game the right way. His energy gets the team excited and pumped up for each game, so the Giants will definitely miss him for that. Unfortunately, Pagan has been labeled as injury-prone throughout his career. He has only played more than 125 games in a season twice in his seven-year career. The Giants were aware of this situation though when they signed him to a 4-year, $40 million contract in the the offseason. This could be considered a risky move given his history of injuries, but Pagan has been a solid force for the Giants since he signed here. On the defensive end, the Giants won’t miss him as much because they have a trio of center fielders who are extremely talented defensively. Offensively, it remains to be seen how much Pagan’s absence will affect the Giants, because it depends on Blanco keeping up his impressive hitting. The Giants will miss Pagan most in terms of the energy he provides for this team. His “never give up” attitude and his determination to win are hard to replace. Buster Posey is an incredibly skilled hitter. No matter what spot he is in the lineup, he’s going to find a way to produce. After hitting in the cleanup spot for the majority of his career, Posey was moved into the third spot in the batting order. Bruce Bochy said this is a permanent change, because he wanted to tweak the traditional order to see if it would spark the offense. 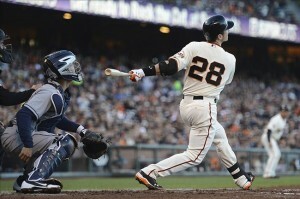 Because of this move, Posey has thrived. When Posey hits third in the lineup this season, he has hit .435 with one home run, eight doubles, 15 RBI’s, a .478 OBP, and a .645 slugging percentage in 62 at-bats. In the cleanup spot, Posey has hit .267 with seven home runs, 12 doubles, 26 RBI’s, a .359 OBP, and a .455 slugging percentage in 176 at-bats this season. The number three hitter is traditionally the best all-around hitter on the team. They’re not generally that fast, but they hit for a high batting average and find ways to get on base. 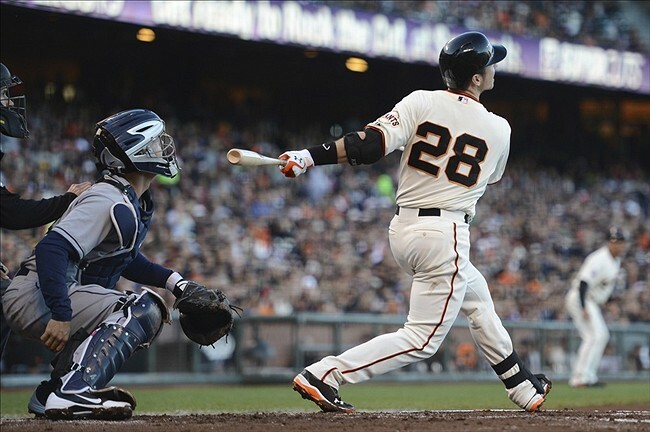 They usually have high on-base percentages and slugging percentages, which is exactly what Posey has exhibited recently. Some other number three hitters around the league are Albert Pujols, Joey Votto, Ryan Braun, and Miguel Cabrera. All of these players have power, but they are selective with their power. They don’t necessarily try to hit a home run every time, in order to maintain a high batting average. They all have great OPS percentages, on-base percentage plus slugging percentage. The cleanup hitter, or the fourth hitter, is also one of the best hitters on the team, but this player generally hits for more power than the third hitter does. This hitter also generally takes a lot of walks. Some examples of cleanup hitters around the league are Prince Fielder, Troy Tulowitzki, Brandon Phillips, and Evan Longoria. These players all have a lot of power and high slugging percentages. Posey definitely has some power, but it’s a little hard to judge how much power he could really have due to the difficulty of hitting home runs at AT&T Park. The third and fourth hitter have very similar roles, but Posey has always seemed to be more of a number three hitter. Posey won the batting title last season after hitting .336, so he clearly can hit for average, and he finished with an admirable .905 OPS. Posey is a versatile hitter who can hit to either side of the field, has power, can draw a walk, and doesn’t chase outside the strike zone much. He also knows how to work pitch counts, hit with two strikes, and adjust his swing in order to get a hit. Posey is the best all-around hitter on the Giants, so it gives the Giants an early advantage when he’s hitting third and comes up to hit in the first inning no matter what. Given his immense amount of skills on offense, Posey naturally fits into the third spot in the batting order. Another reason why he thrives in the number three spot is because the hitters around him have skillsets that are more suited to the cleanup spot or the fifth spot. Hunter Pence has tremendous power, which would make him the perfect cleanup hitter, but he also has a knack for driving in runs, whether that means getting a clean single, a home run, or just a groundout that scores a run. Pence could easily fit into the fourth or fifth spot in the lineup, given these characteristics. Pablo Sandoval also has incredible power and has proven that he can hit for a high batting average too, when he’s healthy. This is why Bochy has normally put Sandoval in the third spot, but he could arguably hit in the third, fourth, or fifth spot. Sandoval is currently out with a foot injury, so, in his absence, Bochy has been hitting Posey third and Pence fourth. When Sandoval comes back, it’s not clear how Bochy will order those three players in the lineup, but with Pence and Sandoval hitting behind him, Posey will for sure keep thriving in the third spot. With two other stellar hitters around him that have power and can hit for average, it gives Bochy more flexibility in putting Posey in the third spot, his most natural spot in the lineup. It doesn’t really matter which spot Sandoval and Pence hit in, because Posey will most likely find a way to get on base for them. 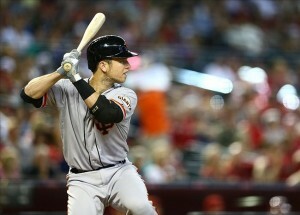 Posey is such a valuable hitter for the Giants, and he will continue to thrive in the number three spot in the lineup. The Golden State Warriors have not released their roster yet for the 2013 Las Vegas NBA Summer League, but it has been confirmed that Draymond Green, Kent Bazemore, Scott Machado, and Ognjen Kuzmic will play on the team. Festus Ezeli was supposed to play, but he is out for 6-9 months after having knee surgery recently. Klay Thompson and Harrison Barnes will most likely not participate, because they are participating in USA Basketball’s Men’s National Team mini-camp in Las Vegas from July 22-25. Summer League is a great opportunity for up-and-coming, young players to develop their games more, learn more about a team’s system, try to make a team, or prove why they deserve a bigger role or more playing time. Thompson and Barnes have already proven themselves and have shown why they deserve to have significant roles on the team. The other young players on this team will each benefit from Summer League in a different way. Green played in the five Summer League games for the Warriors last year and averaged 6.4 points, 7.6 rebounds, and 1.4 steals on 27.8 percent shooting from the field, 20 percent shooting from three, and 90 percent shooting from the free-throw line in 26 minutes per game. Just as the numbers indicate, Green struggled with his shot, much like he did during the regular season, but he rebounded extremely well and shot well from the free throw line. During this year’s Summer League, Green needs to work on hitting his shots more consistently and not shooting too many threes, if they’re not falling. If he works on shooting more efficiently and performs well in Summer League, he could be a valuable asset for the Warriors off the bench, given his superb defense. Bazemore played in four Summer League games for the Warriors last year and averaged 8.5 points, 1.5 steals, and 1.8 blocks on 46.7 percent shooting from the field and 66.7 percent shooting from the free-throw line in 20.5 minutes per game. Bazemore showed off his athleticism and his stellar defense in Summer League, which ultimately earned him a roster spot with the Warriors. Bazemore has a huge opportunity in Summer League this year, since he doesn’t have to share minutes with Thompson and Barnes like last season. If Bazemore can work on handling the ball more, running an offense, and becoming more of a consistent mid-range shooter, then he could potentially have a more consistent role in the regular rotation for the Warriors next season. Machado played in five Summer League games for the Houston Rockets last year and averaged 8.0 points, 5.6 assists, and 2.2 steals on 38.9 percent shooting from the field, 28.6 percent shooting from three, and 50 percent shooting from the free-throw line in 25.4 minutes per game. Machado signed a non-guaranteed $789,000 contract earlier this summer with the Warriors. If Jarrett Jack doesn’t re-sign with the Warriors and they don’t sign another point guard, Machado will have an opportunity to earn minutes at the backup point guard position, even though he might share those minutes with Kent Bazmore. Machado’s more of a traditional point guard than Bazemore and is a great passer, but he needs to showcase more of his skills beyond that in Summer League in order to earn his minutes next season. The Warriors selected Kuzmic with the 52nd overall pick in last year’s draft. He is 7’1″ and is very athletic and mobile, given his size. While playing with Clinicas Rincon in 2011-2012, Kuzmic averaged 10.4 points, 8.6 rebounds, and 2.1 blocks in 24.5 minutes per game. Kuzmic is clearly very strong defensively, is an excellent rebounder, and can block shots at an astounding rate. If he can bulk up, work on his post game, and work on a perimeter jumper, he could help the Warriors add depth to the center position that they need with Ezeli out and Andrew Bogut recovering from injuries. 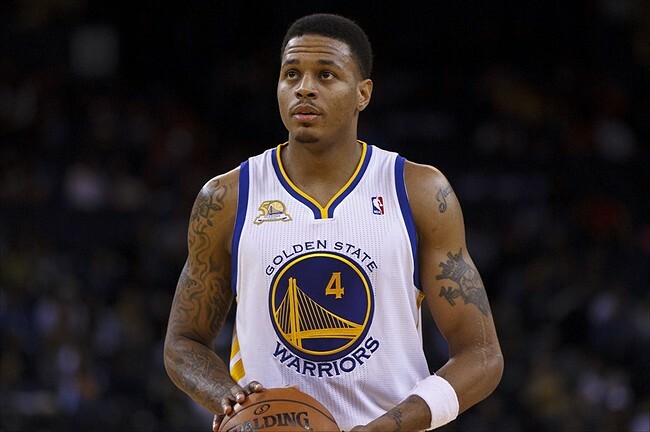 Brandon Rush only played in two games for the Golden State Warriors this past season, but he is one of the most important players for them going into next season. During the 2011-2012 season, Rush was a stellar sixth man for the Warriors. He played in 65 games and averaged 9.8 points, 3.9 rebounds, and 0.9 blocks on 50.1 percent shooting and 45.2 percent shooting from three (sixth in the NBA) in 26.4 minutes per game. Rush was sidelined with an ACL injury last season, and his presence was certainly missed. He would’ve made the Warriors’ bench even deeper and more dangerous. Rush has officially picked up his player option with the Warriors for the 2013-2014 season. It’s not clear if the Warriors will be able to bring back other key free agents off the bench, such as Jarrett Jack and Carl Landry, but let’s assume for now that they bring back both. If the Warriors’ bench next season included Jack, Rush, Landry, Draymond Green, and Festus Ezeli, then the Warriors would have one of the deepest rosters in the league. A sixth man is key to any playoff team. If Jack, who assumed the role of sixth man with Rush out last season, doesn’t re-sign, the Warriors are going to need an effective sixth man who can score and provide energy off the bench even more. Rush is an extremely valuable asset to have off the bench because of his defense, his three-point shooting, and his ability to attack the basket. He is the best perimeter defender on the team, even though Klay Thompson has improved significantly defensively. Rush has good size and length, so he can defend wing players, which provides a great complement to Thompson’s ability to guard point guards and shooting guards. If needed, the Warriors could go small and play a lineup with Curry, Thompson, Rush, Harrison Barnes, and David Lee or Andrew Bogut, or Rush could also come in for defensive purposes and replace Barnes in close-game situations. Rush’s defensive ability would also allow Barnes to focus more on offense, so he doesn’t have to expend too much energy on defense. Rush is also an incredible three-point shooter, which allows the Warriors to spread the floor with several other three-point shooters such as Stephen Curry and Thompson. Having several three-point shooters on the floor also allows Andrew Bogut and David Lee to have more to operate room in the paint. Rush is a versatile player who can also attack the basket. He’s one of the most athletic players on the team, next to Barnes. He can easily pump fake his defender on the three-point line and cut to the basket because of his quickness and athleticism. Curry is arguably the most important player to the Warriors. However, a deep bench and a reliable sixth man are also important for a playoff team. Rush is the athletic, defensive-minded, versatile player that the Warriors lacked this past season. He provides energy off the bench and has a wide array of skills that complement this Warriors team well. Rush is an extremely important player to the Warriors, especially if Jack and Landry don’t return to the Warriors next season.